This year I decided to spend part of the summer in Berlin to reconnect to the culture and language of my country, and to delve into some of the subchapters of it’s recent history. In my studies and in various encounters at memorial sites, in conversations with visitors from all over the world, in artists’ ateliers as well as in discussions with a Berlin-based historian specialized in German resistance during the 1940s and a Toronto-based friend/human rights expert, the question of identity turned out to be of special significance to gain a better understanding of myself and of recent German history that has influenced my ways of feeling and thinking. When walking across Alexanderplatz tonight I took some time to look at these architectural applications from the GDR period for a while: the famous world time clock and TV tower that together form a spacy ensemble embracing Alexanderplatz railway station, Kaufhof department store and the ever increasing display of Saturn, Media Markt and, a most recent addition, an Irish seller of inexpensive clothes. After this I took a tram and finally walked home with the impression that these pieces of evidence of a technocratic faith in the future form ingredients of my country’s identity as good as Goethe, Beethoven, Mercedes cars, the atrocities of the Nazi regime, Baader-Meinhof, the peace movement of the 1980s, Dr. Motte and, last but not least, the Soccer World Championship. Searching for contemporary signs of identity remains a difficult chore. 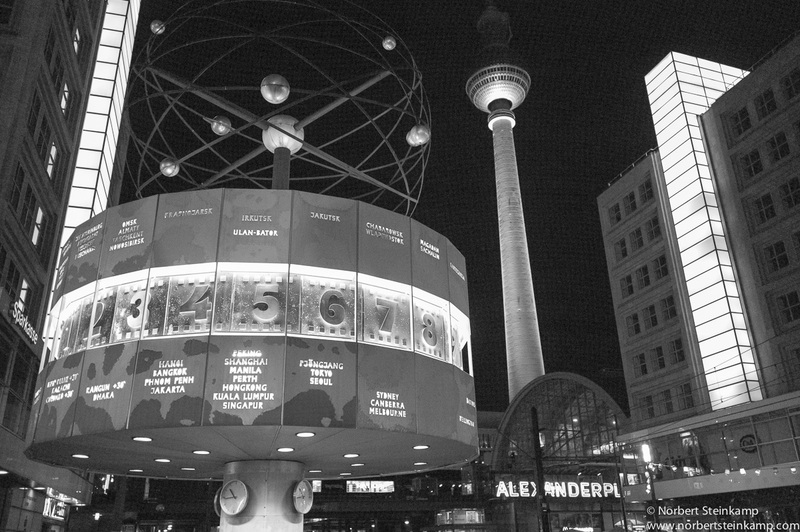 The space symbols of Alexanderplatz could teach us to direct our attention to areas off the beaten tracks. My conclusion after a couple of weeks in Berlin is that this search has yet to begin. Right now we seem to be lost in the translation between the countless options we currently have. This entry was posted in Architecture, Man-altered Landscape, Self reflection and tagged Berlin, Identity by Norbert Steinkamp. Bookmark the permalink.